Ladies with thin and greasy hair, come closer - slicked back and wet effect hairstyles will be the main hair trend 2015 during spring/summer season. If you have fine hair that seems to attract grease in an instance after being freshly washed, I must say that you are the lucky one. 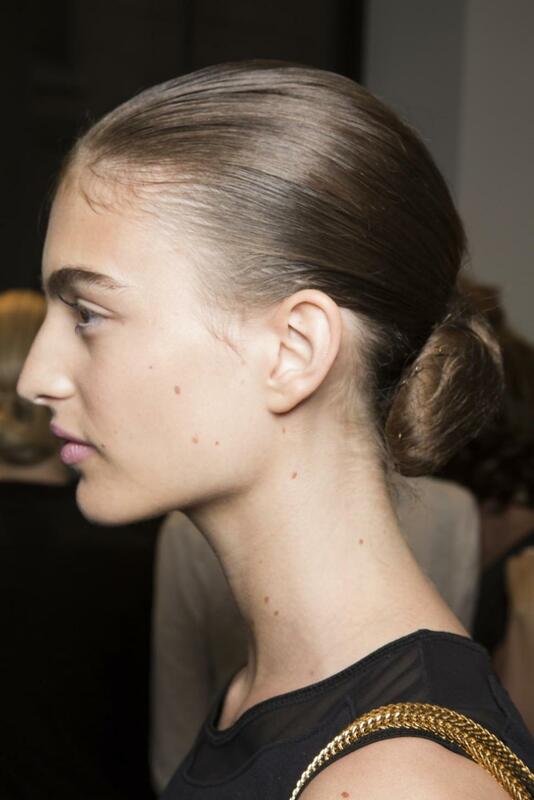 New York and London Fashion week among all the beautiful popular hairstyles have put accent on pulled back shining hair, that was seen all around almost in the collections of all designers, from Julian McDonald and Alexander Wang to Carolina Herrera.Their models' hairstyles were sleek and smooth, mostly long hairstyles just pulled back, or tied in a ponytail. Well, I must say that waves and curls were not left out totally, but you could spot them only at the ends, the roots being sleek and glossy. 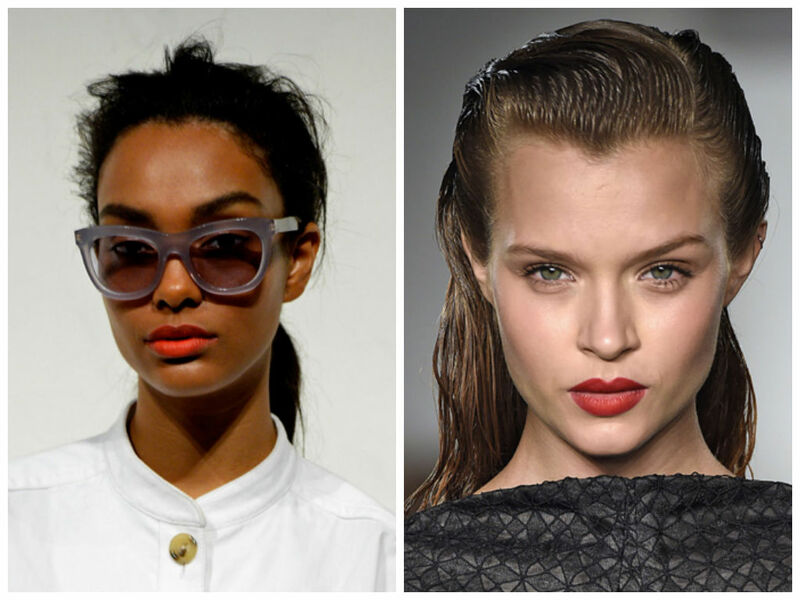 Let's see now some of slicked back hairstyles 2015 from the best Fashion Weeks. To have such feminine looks you should apply hair gloss, spraying it on the roots and crown area. Mind that hair should be healthy and do not forget about hair conditioners. I should confess that J Crew model is more to my heart with her looks. 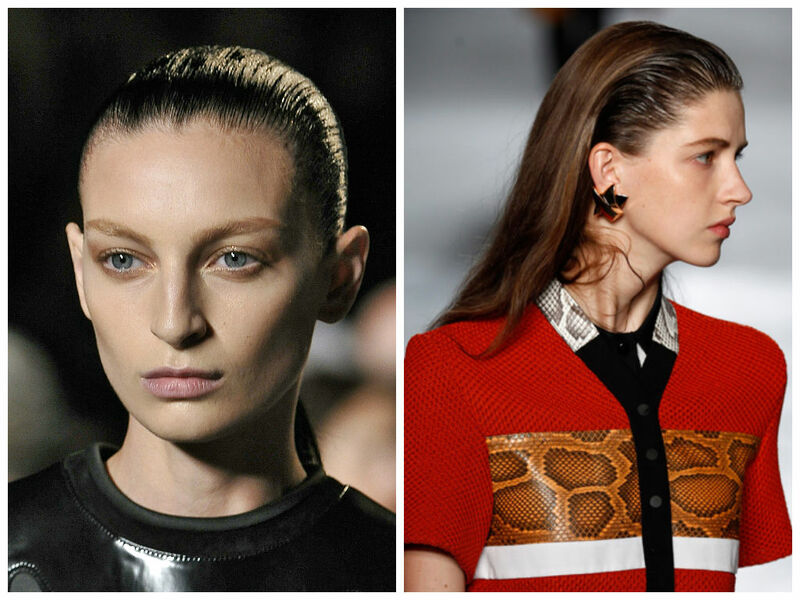 Tie your hair into a loose ponytail and mess up hair at the front, you will get a look both street style and elegant. This kind of easy hairstyles will be on trend spring / summer 2015. 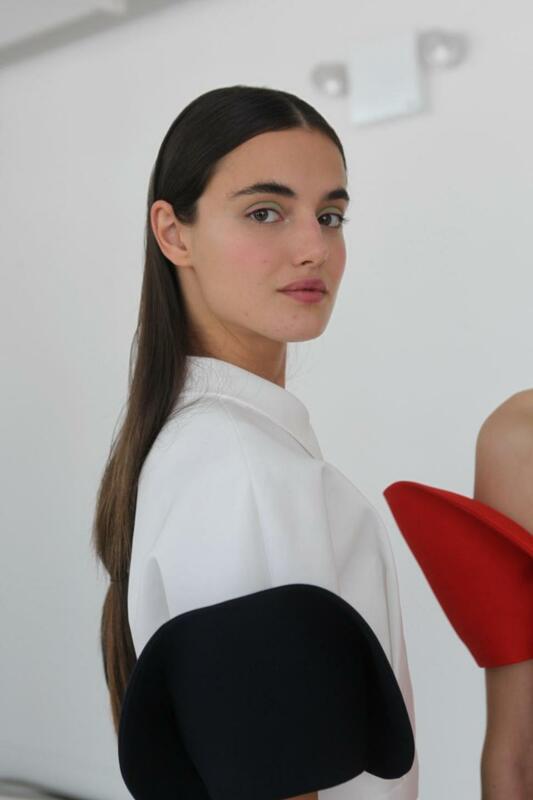 At New Yor Fashion Week spring / summer 2015 hair trends introduced these simple designs, that look very strict on one side, and are quite womanly on the other. 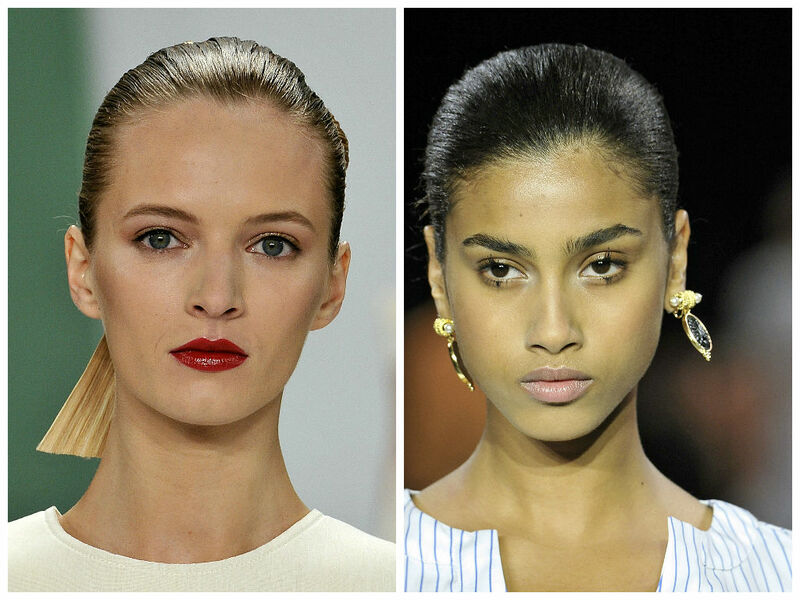 Slicked back hairstyle ending in a low bun is very trendy. She looks as if just from shower and this is the main idea, natural looks as if with no make up and hair styling. Center parting is another mainstream hair trend 2015 that combined with sleek looks make the most trendy hairstyles for SS15. 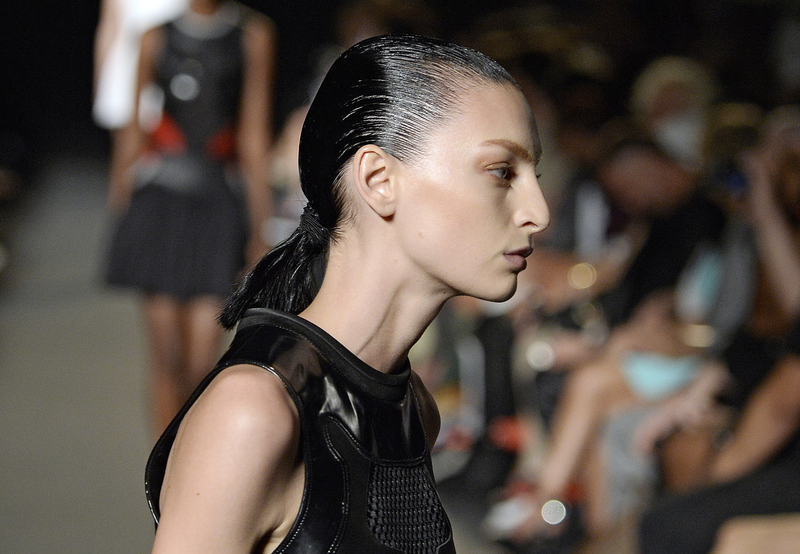 Alexander Wang hairstyles can look very edgy and dramatic, showing the ultimate solutions for slicked back hair trends 2015. Here is an exquisite design of slicked back hairstyle ending into a comlicated ponytail that looks very fresh and inventive. While choosing this much slicked hairstyle, you need to decide with hair gloss, either to go too edgy, or stay natural and have the greasy look on the roots only.